The other day a close friend of mine was complaining about the group training sessions at her local gym. In fact, she was considering leaving the gym and finding somewhere else to work out. The problem . . . women who, whether it’s intentional or not, slow down the session by engaging the trainer in conversation, asking needless questions, socialize with each other, complain about the pace of the workout, and so on. I’ve seen quite a bit of this myself in gyms, both in group sessions – particularly small groups, and also with women working out on their own. It comes with the territory. And quite frankly, it’s the responsibility of the trainer to keep things in check for the benefit of the whole group. If he or she isn’t doing that then the bottom line is they’re not doing their job properly. 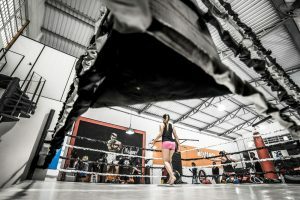 Having been involved in training women for a while now, I’ve learned that even among women who actually make the effort to get down to the gym on a regular basis, there are those who are very serious and motivated to work hard to get to their goals, and then there are those who are simply going through the motions. And of course you have cases everywhere in between as well. A good trainer needs to know how to push her clients to achieve things they normally can’t do on their own. Things they never even thought they could do. This isn’t always easy though, because everyone has their own unique personality and therefore has to be approached differently. But let’s forget about trainers for the moment, and let’s talk about you. If you’re serious about achieving your goals, whether it’s to lose weight, to tone up, to improve your fitness, or whatever, it’s important that you take responsibility for your own training to some extent. There will be times when you need to work out alone. There will be times when your trainer is a little soft and allows you or your group to slacken off a little too much. There will be times when you may be working out in a large group, so your trainer won’t be able to keep a close eye on you and push you hard. If you’re serious, you won’t allow your success to lie in someone else’s hands, or to be held back by outside influences. Sure, having a trainer is great, but at some point you also need to be able to step up on your own when the need arises and ensure the job gets done. Start by looking at your own work ethic in the gym. Are you a worker, or a staller? Be honest with yourself. Do you push yourself hard in the gym, or are you really pretty casual about things? Do you treat your training sessions more like a social event? There’s nothing wrong with socializing at the gym, just don’t do it during workouts. By all means, chat away before and after your sessions. But treat your training time as holy – you’re not there to make friends, you’re there to make progress. If you’re around women who like to talk and gossip during workouts, politely tell them that you’d be happy to sit down with them over a juice after the workout, but that you really want to focus all your energies on your training until then. If you find yourself in a workout group that’s very distracted and wastes a lot of time with irrelevant questions and dawdling, do something about it! Realize that they’re holding you back and keeping you from your goals. Talk to the trainer about it, and if she doesn’t do anything about it, change groups or change gyms. Do you ever find yourself reflecting on a workout session you just did, thinking deeply about how hard you pushed yourself? Well, you should. Women who aren’t that serious about their progress are rarely hard enough on themselves to ask questions such as this. The same goes for areas of improvement. Get into the habit of critiquing your workouts and pledging to correct any weak points in your next workout. Remember that you should be aiming to make constant improvements. Remember that the aim of each workout isn’t just to raise a sweat so that you can feel good about yourself and tell all your friends that you work out. It’s to extend yourself, to improve in some way. If each of your workouts is pretty similar in content, quantity and difficulty, then your body isn’t growing or improving, and you’re not getting the most out of your training. Are you working out mainly for the “pose” value? My business partner, Fabian, used to laugh about one of his old neighbors who had a weight bench in his garage gym. He’d get all dressed up in his workout gear, but Fabian only ever saw him sitting on the bench, talking to his friends – never actually doing anything. Now, this guy is a pretty extreme case, but does he sound a bit like you, at least some of the time, when you’re working out alone? If you find the going a little too tough at any point during a workout, don’t stall by asking your trainer a question or using some other diversionary tactic to slow the pace. If you can’t do it, you can’t do it, that’s fine. But own it – admit to yourself that you’ve reached your limit. At least it will drive you to try harder next time. You can really learn a lot about yourself while you’re working out. Sometimes you walk away from a workout feeling disappointed for not having tried harder. That’s OK. Don’t beat yourself up over it – just use it as motivation next time. When you walk away from a workout knowing that you gave it your all, you feel great about yourself. Savor that feeling and be proud of yourself – it’s a huge reward. If you’re the competitive type, find a workout partner who’s the same and work together to push each other competitively. If you’re not the competitive type, find a workout partner who’s the same and support and encourage each other. It’s simply a matter of doing what works for you. You’ll never push yourself in any area of life without a good reason. Find the deep-seeded reason for why you’re working out and meditate on it daily. Look deep within yourself, it has to be real and it has to be personal and specific. Vague cop-outs like “because I want to lose weight” won’t cut it. How exactly, and why, do you want your life to change? Weight Machines vs Free Weights – Which Should You Be Using? I was very encouraged to find this site. The reason being that this is such an informative post. I wanted to thank you for this informative analysis of the subject. Whoah this weblog is great i love reading your articles. Keep up the great work! Heya i’m for the first time here. I came across this board and I in finding It really useful & it helped me out a lot. I’m hoping to give something again and help others such as you helped me. I am glad to be a visitor of this thoroughgoing web blog, thank you for this rare information! Admiring your time and effort putting into the website. Its awesome to come over a different blog site once in a time that isn’t identical old re-written material. Excellent article! What a great quality article! I’ve learned some new things about this subject. Thank you. Hello there, I just wanted to tell you how magnificent I think this website happens to be. I do not generally touch upon peoples’ blogs yet this was truly too outstanding for me to stay silent. Thank you for posting this remarkable info. Got me time to read the countless comments, but I enjoyed this short article! Such a well written post.. Thnkx for sharing this post !! Of course, what a great site and informative posts. Regards,Reader. Hey There. Thanks for the post. I’ll certainly return. Thanks for your time for this excellent read!! You produce some really good points. My partner and i actually loved this great article. Thank you for this nice read!! I generally don’t leave blog comments but your blog forced me to, wonderful work. Thanks so much for giving me this update!! Appreciate your sharing this latest post. Thanks for taking the time to post this, It is extremely useful for me. Exceptional publish, helped me out. Continue to keep up the impressive posts! I wanted to thank you for the amazing blog you have created here. It is full of useful tips for those who are interested in this. Nice post. I enjoy browsing your blog posts. Love what youve got to say! Thanks for this helpful content! The post was totally marvelous! Hello, great article helped me a lot !! Thanx!! !